The process of deep tining the greens involves the use of solid tines that are able to penetrate 6-14 inches into the soil. Normal aerification will penetrate 5 inches max. 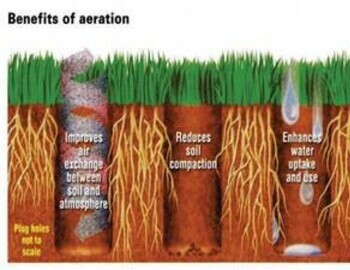 The purpose is still the same to alleviate compaction and increase the pore space in the soils for air and oxygen, thus creating a more aerobic condition for turf roots to "thrive". The "normal" core aerification that we do in the spring is essential to remove thatch and relieve surface compaction. We will be penetrating the greens this month about 10". This is very beneficial in improving drainage and allowing the roots of the greens to breathe. In addition to the action of the tines piercing the greens, this machine will also create a "kick" action where the soil is further fractured below the surface. The fracturing that occurs below the surface is very helpful in improving drainage and allowing more oxygen to surround the roots. By loosening the soil deep down we will also improve root growth. The roots will grow into the looser soil much easier than if the soil was compacted and hard. Think about a plant that you buy at a nursery. The bush will most likely have roots growing around in a circle around the pot. If you do not loosen those roots up and provide loose soil in the ground where the bush is to be planted, the roots will most likely continue to grow around the plant and never venture out into the soil. Something similar to that is happening in the greens.